This past year 3 friends I love lost their moms to cancer. In the middle of all the chaos I didn’t want to intrude or get in the way. I offered my full support but it never felt like enough to me. They were at chemo appointments & hospitals and I wish I could have been so much more helpful! There is a history of 6 different cancers in my own family, so this isn’t the first time I’ve watched people go through this and I want to offer more to those I love. So what do you give a caregiver who gives of themselves completely but doesn’t know what to ask for or how to ask for help themselves? Sarah Banks of "Care Chronicles." Pledge today at http://www.kickstarter.com/projects/NewCaregiverResource/care-chronicles-customized-cancer-treatment-orga-0. I went to a hipster meditation session once that seemed trivial until the leader asked everyone who had lost someone this year, or who knew someone who lost someone this year, to please raise their hand. I would say 98% of the hands in that room went up, and the 2% were probably not paying attention. Death is par for the human course, and is something everyone is dealing with, all the time. Some, however, are doing so in excruciating, hands-on ways, and others more from a distance. What do we do to help those braving the frontlines of mortality and illness? We start with ourselves. There is nothing more incredible than a friend with poise, calm and the ability to give, who arrives at a traumatic scene, a hospital, a chemo bedside, a funeral or a wake. Humans are full of fear. The fearless are the ones that comfort the needy without question. We need to cultivate our own fearlessness so that when a friend calls us panicked, or a family member falls ill (God-forbid), or we bear witness to the horrible, our fearlessness somehow, through loving action, becomes contagious. This is done through self-care, through facing our dark sides, through working on our own stillness so we may offer the same to others. It is a balancing system. The fearless care for those in need until depleted, then someone swoops in, someone like you, and holds the caretaker in their arms until a virtual rebooting takes place and they can continue the job of caring for the sick. What you give a caregiver is a presence that says, “this is your time.” For more ideas see: How Do I Support Them Through Chemotherapy? 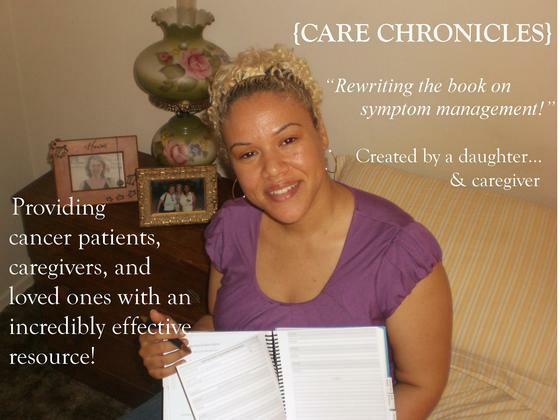 There are also admirable projects like “Care Chronicles,” a symptom management workbook for caregivers and patients. Coined by a woman named Sarah Banks in memory and honor of her mother, this cancer management workbook is meant to help ease the difficulties of both the caregiver and patient. To support Sarah Banks’ campaign, click here. She is raising money to self-publish packets to distribute to hospitals and doctors’ offices to offer answers to your precise question. There are only 27 days left to meet her $8k goal. One thing you can do for your friends and family members as they go through this: make a pledge to a cause like this one in their name, and tell them you just made a step towards easing the suffering of others. For more information and help, check out: Everyone’s Guid to Cancer Supportive Care: A Comprehensive Handbook fort Patients and Their Families by Ernest and Isadora Rosenbaum.